Meet Tater – he’s a young boy that’s full of energy! Under two years of age, Tater is kind of slow to get acquainted, but once he trusts you, he’ll be your best pal! He is crate trained but needs a bully breed experienced alpha parent to help him continue to grow into a well behaved boy. We require an adoption application and a home visit before placing a rescue dog in a home. These steps aid us in making the most ideal decision for each and every dog in our care. 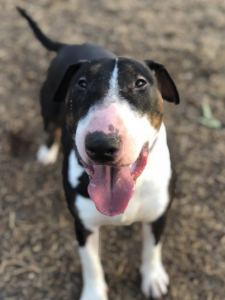 Following the adoption application, we will schedule a home visit with you prior to meeting the available bull terriers. We may also make periodic visits after adoptions are finalized to see that things are going well. Rescues are placed in adoptive homes on a foster-to-adopt trial basis, this period can be between 10 days to 3 weeks, and is to ensure the rescue is a good fit with the new family. At the end of a successful foster-to-adopt period, we will finalize the adoption.